The Boy in the Dalai Lama’s Arms. An iconic faded image on a stamp provides an occasion for Tenzin Tsundue to travel back in time..
My parents labelled me the unfortunate one for not being the boy in the Dalai Lama’s arms. I wonder how many Tibetan parents said that to their children, and how many of us felt deprived. This was how we kids slowly got introduced to our spiritual leader while living in the refugee camp in the Mysore district of Karnataka state where our families had been rehabilitated after many years of labouring as road construction workers in the Himalayas. The small picture of the youthful Dalai Lama carrying a little boy in his arms had been published as a postage stamp. I remember a monochrome, greyish, square image. And the object of our envy, a chubby little boy who made us six year olds look like new-born changelings. Our makeshift camps had Tibetans from all across the Tibetan Plateau; never in history had there been such a levelling of people from different regions of Tibet, social and political statuses, castes, dialectical and religious sectarian groups, disparate tribes living together. Exile had corralled us all in one camp as equals. We were learning the ABC of Democracy and swiftly unlearning old customs and superstitions and traditional rivalries. The invasion and armed occupation by our neighbour, China, had led to the exodus of Tibetan refugees from their homeland, and as they traversed across the Himalayas they lost loved ones to frostbite, Chinese bullets and starvation. And on arriving in the plains of North India in the heat of the summer, thousands died of diseases which were alien to Tibet. The Dalai Lama’s leadership, his vision and India’s refuge gave the escapees a new lease of life. My first memory of seeing the Dalai Lama in the flesh was at a picnic in Manali. I was a little schoolboy in the third standard, and one day we were all packed into two trucks and taken on a school outing from Patlikuhal in the Kullu valley. I remember seeing the Dalai Lama sitting high in front of us at a large public gathering. We proudly share the first part of his name, Tenzin Gyatso, as a customary blessing to new-born Tibetans. Today, the Dalai Lama has raised an entire generation of Tenzins who are shouldering responsibilities in the freedom movement in the footsteps of their spiritual guru. Almost unrecognisable when he escaped in 1959, today His Holiness has grown to become a symbol of peace and nonviolence, a leader not only among his countrymen and followers, but arguably the most iconic. 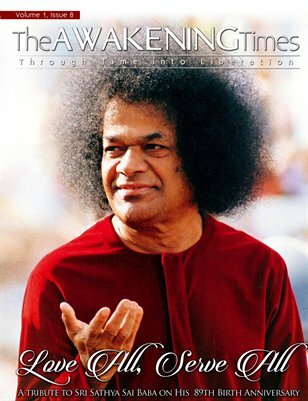 In the Lap of Sri HariThe March Edition of The Awakening Times Magazine is out!